I’m not a morning person. I’d love to bounce out of bed each day however that’s just not me. Add to each morning the whirlwind of getting ready for work, my two tornadoes ready for school and us all out the door in time – it’s mayhem. Anything that can help ease the craziness of my mornings is a welcome relief (and I’m not just talking about coffee!). Last year I bought two packs of Chore Chips from Perth maker Games To Go. These little wonders have been a welcome addition to our morning routine and given my tornadoes a sense of independence and achievement with each task they complete. Each set comes with nine magnetic small wooden disks, each with a job for my tornadoes to do before we leave the house each morning. Their eight jobs include have breakfast, clean teeth, get dressed, brush hair, make bed, pack bag, tidy toys and the all important sunscreen. Each set comes with a ninth ‘You’re a star’ chip for when all of their jobs are done. 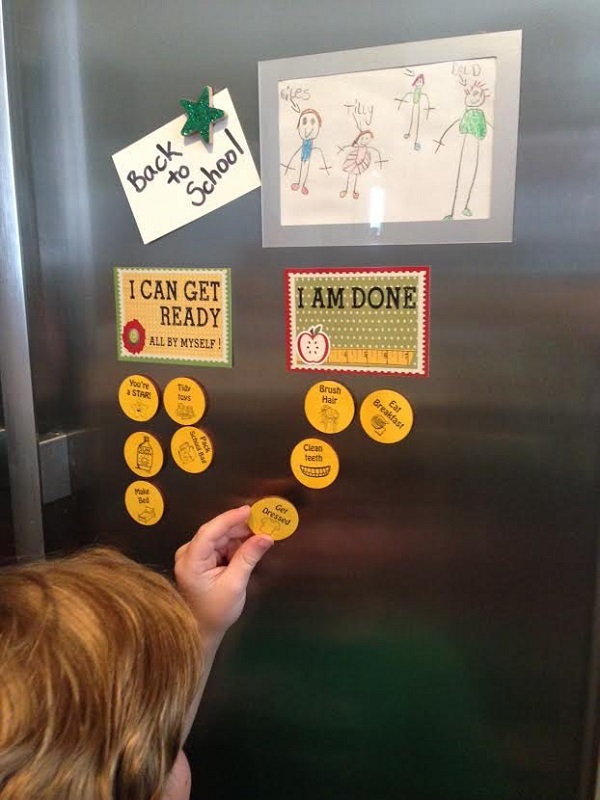 As our fridge doesn’t have a magnetic door like the one pictured above, I have bought a couple of small magnetic whiteboards – one for Miss T and one for Mr TT – which we’ve hung up on the wall. Each day their chips start under the “I can get ready” magnet. 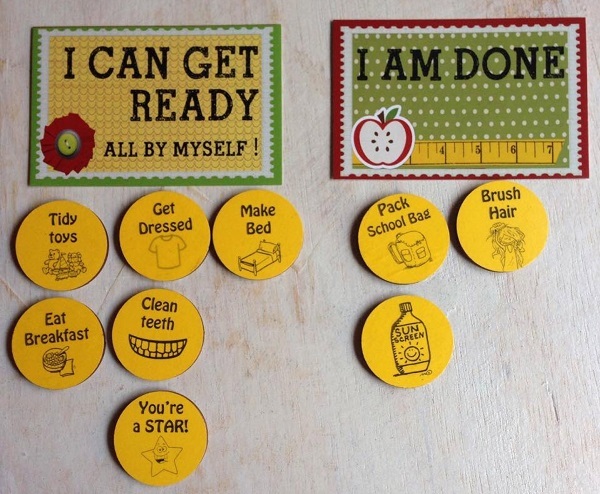 As they complete each chore, they move the chip to under the “I am done” magnet. It’s like a game. I’ve even linked their Chore Chips to their pocket money so they know exactly the jobs they need to do to get their weekly Spending-Saving-Giving pocket money. 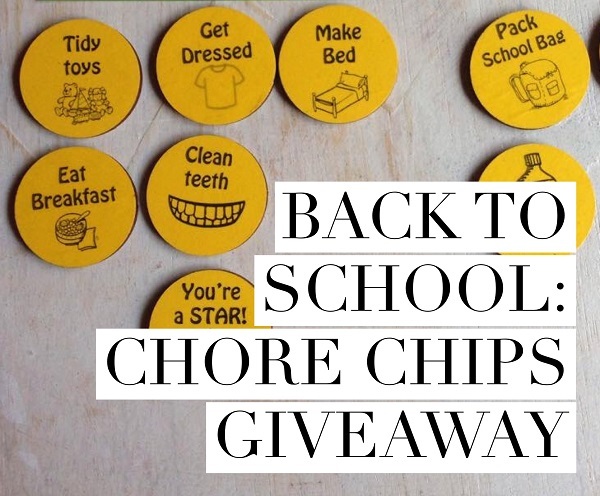 Chore Chips come in a number of different colours and if you need extra jobs included (such as feeding a family pet), custom chips can be ordered separately for $2 each. Thanks to Games To Go, I have two sets of Chore Chips to giveaway to one Gift Grapevine reader (valued at $15 per set). All you need to do is tell me by commenting on the Chore Chips post on my Facebook page: Which chore would you most love help with in the mornings and why? Terms and conditions – This giveaway is only open to Australian residents. This giveaway closes at midnight AWST on Saturday 28 January 2017. Winner will be contacted on Sunday 29 January 2017. One entry per person. This is a game of skill. Entries will be judged on their creativity by a panel who will decide the winner.